I’ve been to Iceland once before, also on a stopover, spending 24 hours in Reykjavik, so I was familiar with the country. This was my first time at Blue Lagoon Spa, and I know people have conflicting opinions about the place. Some people love it, and others think it’s a tourist trap. I didn’t go with very high expectations. To get there from the airport, you can drive or take a taxi (no Ubers in this country), but if you’re without a car, there are scheduled buses that take you from the airport to Blue Lagoon. If you’re traveling with luggage, you can store them at Blue Lagoon. I had wanted to store mine at the airport, but the lockers weren’t conveniently located. I booked the bus and entrance ticket all in advance. Summer is peak season at Blue Lagoon. I got the Comfort package, which gets you a towel, both face masks, and one drink. I recommend booking an in-water massage too, as that allows you to bypass the regular entrance line to the much shorter line for massage appointments. The massage also gets you a robe, which is why I didn’t feel the need to get the Premium or Luxury entrance packages. After going to the underwhelming hot springs in Banff, which was basically an outdoor pool, I found Blue Lagoon amazing in comparison. The changerooms are modern. The waterproof wristbands they provide are so convenient. Not only does it allow you to open your locker, you can buy food and drinks with it, and you just settle up when you check out of the spa. I did have a little trouble using the wristband for my locker (someone else had accidentally locked my locker with her wristband), but attendants were around to help. I had expected the place to be crowded, but it was only at 70% capacity on that day, to my relief. 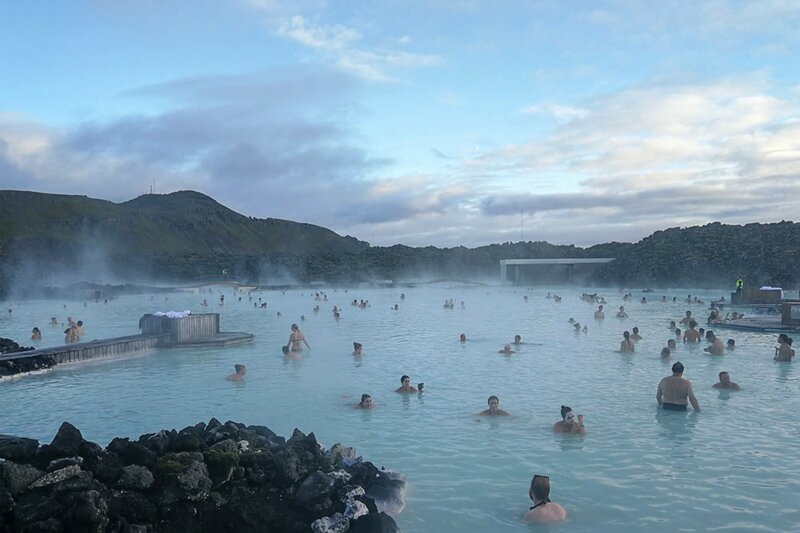 While Blue Lagoon is 100% powered by geothermal energy, it is not a natural hot spring. Blue Lagoon calls it Ecocyle, a unique relationship between nature and science. The seawater is actually from a geothermal plant next door, so the water is natural, but the spa itself is built by man. The warm water, which is rich in minerals, combined with the silica mud, is great for the skin. People suffering from psoriasis and other skin issues may find it beneficial. The silica mud mask (the white one) cleanses and exfoliates the skin. Leave it on for ten minutes or so. Later, I applied the green algae mask, which nourishes the skin. My skin was feeling dull from the airplane ride, not to mention the muggy London air, so the whole experience made me look and feel so much better. When it came time for my massage, I went to a private area and waited. Clocks are around the spa to help you keep track of time. This was one memorable experience. You’re lying on this floating mat and looking at the sky while getting massaged. The Relaxing Massage lives up to its name. Again, I highly recommend it. My massage therapist was a burly Icelandic fellow, and we made light conversation about his life in Reykjavik. There are quite a few options for food and drinks at Blue Lagoon, from quick bites to fine dining. A couple of bars are around the hot springs. If you want fresh drinking water, there’s a fountain near the back of the hot springs. The water is naturally filtered by volcanic rock—how cool is that? A dress code is in effect at the spa. Bathing suits are required, although you must shower without a bathing suit before going into the water. The showers have doors, so you can do so in privacy. Oh, they always recommend you put on lots of hair conditioner and/or tie your hair up because the geothermal water will make your hair feel dry. If you have chemically coloured hair, you might want to be careful, as the water might strip the colour out. I didn’t really care, so I let my hair down. Yes, my hair felt like straw for the next few days, but the silica is not harmful for the hair. In fact, I heard that it’s good for the hair, so I didn’t mind. Blue Lagoon is so popular that it’s expanding. They say they’ll be finished with construction by the middle of 2018. That’s something to take into consideration if you’re planning on visiting, although I don’t think you’d be bothered too much. I was there on a Tuesday and didn’t hear any construction noise, although I did see a crane out there somewhere. They will be changing their entrance packages and pricing after March 1, 2018. I’m relieved my flights were on time because the bus, entrance, and massage were all scheduled at specific times. The only thing thrown off schedule was due to an error on my part. I misread the bus schedule back to the airport and missed the last bus. It was okay because I caught a cab and got to talk to another local, who told me about the effects of volcanos in Iceland. He agreed that Iceland had the freshest air, remarking that he noticed a difference when he went to Finland. Really—Finland? I’m not sure if Icelandic people would last long in Beijing or even New York. I flew Icelandic Air, which was why I had the stopover. I always like to watch one of the indie Icelandic movies in flight. This time, I watched Heartstone, about two boys growing up in a remote fishing village in Iceland. On the last trip, I watched Metalhead. Man, these Icelandic films are depressing… but beautiful. They give me an idea of what it’s like to live in rural Iceland. I also really enjoyed hanging out at Klefavik airport. I ate Icelandic chocolate, bought an Icelandic blanket and cardigan (both ethically and sustainable made! ), and a bunch of English-translated Icelandic books, all while listening to Björk in my headphones. Really cleaned up the place. Hopefully, my next trip to Iceland won’t just be a quick stopover. I’d like to be here for at least a week, do the Golden Circle, see the Northern Lights, and maybe even the annual Iceland Airwaves music festival.